Another delicious dinner via Pinterest. It’s super quick and easy and we all loved it. I have made it a few times since I found it a couple of months ago. I bet this is an incredible casserole! My bunch loves casseroles and sloppy joes, so I bet they would love this! It’s so delicious! You should give it a try! it looks yummy!! I haven’t had manwich or tater tots in forever. It really is. 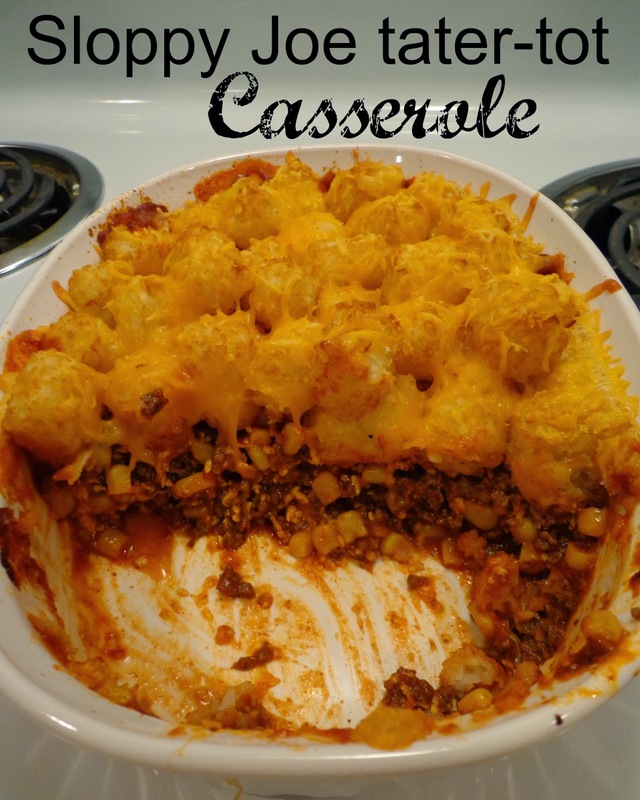 We loves sloppy joes and tater tot casserole so this was a great mix! I need to try this, my hubby loves sloppy joes! We love sloppy joes too. It’s really good! We love tater tot casserole, and this looks like a delicious variation! Thanks for sharing at Food on Friday. Thanks TaMara! It’s such a quick and easy meal! this is very good , i have made it a lot of times over the yrs. easy and quick to prepare and really tastes good . with a kidney bean salad and hot brown and serve rolls . Thanks Jan! It is great, my family loves it! Thank you for sharing Nicole! I’m glad you all loved it! It is definitely a favorite in my house! I have made this several times (again tonight). My kids love it! I use roasted corn in mine. Yes! I do corn sometimes too! So good! I love that! So many ways to change it up! Thanks for sharing! My grandsons loved this, ages 5, 3 & 2 years. I sauteed chopped onions, bell peppers, garlic & black pepper before adding the ground beef/venison. I put a layer of shredded cheese under the tater tots & just sprinkled cheese on top. Will make this many more time! WINNER!